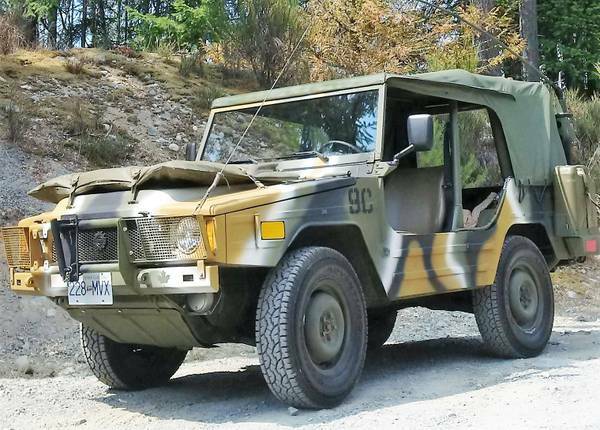 Here a unique all terrain military vehicle built by Volkswagen for Canadian army, as the picture is a Volkswagen Iltis released in 1985 like new condition only 340 miles on it. The Iltis it small, lightweight 4x4 car seems took many of its styling cues from the VW thing. It was offered in craigslist 3 days ago asking for $9500. Need more details please read more below. Rare offering on this perfectly amazing 1985 Volkswagen ILTIS LAV MIL SPEC LIGHT ASSAULT VEHICLE. This little Jeep like 4-wheel drive has a proud history serving its troops wold wide. Made in Germany and assembled in Canada by Bombardier factory. This is a true military army jeep that saw service overseas with UN peace keeping forces on missions throughout the world in the 1990's. This particular ILTIS is in museum grade top quality finished condition, using's only brand new NOS parts for the complete restoration. Has documented 340M (Miles) on odometer. Every part mated to perfect award winning detail, all factory military stickers in place, every screw, nut, and bolts new or replaced, every hose from stores all parts from unissued military stock supply. This is a good solid ride and go anywhere bug-out with the famous VW/Audi Quattro 4x4 Drivetrain and the proven long run 1.6L VW rabbit engine. Easy to find parts. This is the vehicle that won the historic Dakar Race, in fact the Iltis came in 1st, 2nd and 3rd place. Yes it comes with set of brand new Doors, matching set to the brand new NOS top, and NOS seats. This thing is amphibious and has a submersible exhaust. NA|TO fire extinguisher, recovery accessories, jack, shovel, and military axe all on board. All brakes replaced with brand new parts, new stainless factory exhaust, new shocks, new lines, new NOS drive train, everything was replaced NEW with NOS parts. All high quality military tires are brand new, this is a rare offering for any savvy military vehicle investor, they have a proud history and are only going up in value.